A striking figure enters the Directors room at the Faculty. Tall and black-eyed, her most striking feature is her voice, which leaves no doubts about her presence. Coordinator of the General Inpatient Unit of the Department of Cardiology, Dulce Brito is the Cardiologist of all trades linked to the heart. 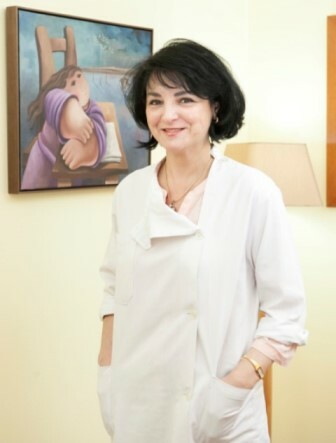 She also teaches Cardiology as an Assistant Professor at the Faculty of Medicine of the University of Lisbon, is part of the Pedagogical Council of the Faculty, the Directorate of the College of Cardiology Speciality of the Portuguese Medical Association and is a member of the Nucleus of the Study Group on Heart Failure of the Portuguese Cardiology Society. If she let affections dominate everything she has to do, she wouldn’t do half of it, but although she says she does not care much for physical gestures, the truth is that, behind the first layer of distance she creates, there is a woman filled with responsibilities and concern for others. However, she does not pats on the back or paternalistic gestures, which that are usually disguised as some false concern. But she helps out, both in her personal life and at work. “I don’t touch people that much, except when I say goodbye, or when I greet my patients, but to those I give my hand because they need me.” During the entire interview, she maintained a clear line between her private and professional life, but she did mention that her mother was the main reason behind the woman she is today, because she always let her “soar”, believing that this was the right way of loving a child. Even then, she was a very assertive teenager, who knew she had “a natural way with words”, but getting into Law was out of the question, as it would become too arid for a woman who is ruled by her heart. “I was at a bus stop when I decided that I was going to take up Medicine”. A woman who is too independent to feel any outrage, at an early age, she dove into a still predominantly male-dominated world. When I ask her if she has ever felt fragile in the midst of so many men, she explains that she has never been discriminated against because, in truth, she has never allowed it to happen. This profile explains, with relative ease, why Dulce Brito is the Coordinator of an entire team, in an area as delicate and broad-ranging as Cardiology Inpatient Care. “This unit has three senior cardiologists – among whom I include myself – and each of them coordinates their own team. Despite being a coordinator, I also have my own individual role as a doctor, with a team for which I am directly responsible”. Attentive to the ill but also to her teams, she speaks of the importance of giving people the opportunity to advance their careers and, as a leader, she knows that she has to motivate each person and unlock their unique abilities. “I do not coordinate alone. A few years ago, I invited a colleague to share leadership roles, because power must be shared and people deserve to show what they are worth, they have to be given the opportunity”. In addition to her role in Inpatient Care, she also sees patients in consultation almost every day and her concern for these patients are different, but equally important, as “patients that are not hospitalised continue to exist and they also need to be taken care of”. Her main focuses within Cardiology are Heart Failure and her “beloved child” is Myocardial Diseases, or Myocardiopathies. In charge of consultations in these two areas, she says, however, that a Cardiologist always sees and welcomes all patient profiles. With prevalence increasing to 25% by 2030, Heart Failure is raising to the top of Hospital agendas and has been the subject of growing concerns from the Ministry of Health. Held on 6 May, the European Heart Failure Day raises awareness to patients with this pathology. Knowing that heart failure has a calculated prevalence of about 2% in all countries considered developed, and that in Portugal alone there are an estimated 380,000 patients, how do you care for hearts whose diseases continue to increase? She was referring to the impressive “business card” that led me to Cardiologist Dulce Brito, the follow-up she and her team conduct on patients with heart failure after a hospital stay at the Cardiology Department. The team that Dulce Brito coordinates in this project consists of 10 doctors who “wherever they are, with other tasks, accompany all patients and share responsibilities”. Within the area of Health, Portugal spends a good portion of its budget on hospitalisations. Studies about to be published and whose numbers have not yet been published seem to point to promising results for the Heart Failure programme carried out by the Cardiology Department of the Lisbon Norte Hospital Centre, translating into an excellent success rate in terms of mortality. This success is owed to the team and its programme, the RICA-HF (Heart Failure Team). It is within the scope of the follow-up of these patients that a pilot project – Telemonitoring Chronic Heart Failure, also coordinated by Dulce Brito, falls under. “The Ministry of Health has already taken some initiatives regarding the problem of heart failure. What telemonitoring aims for is the early detection of symptoms and other manifestations of cardiac decompensation, leading to timely action by physicians, thus avoiding the need for hospitalisation”. “Parameter values are automatically transmitted to a Telemonitoring Centre, and when the parameters ‘fall out’ of the preset values (each patient has their own limits), ‘alerts’ are generated. These are evaluated by the team of health professionals at the centre, also according to criteria established by the cardiology team, and the patient is contacted by telephone. If these are true “clinical alerts” the team of cardiology is immediately contacted and connected to the patient, to decide on the necessary intervention. At the moment, we have 19 patients. We started last December with only 9. Our goal is to reach 30 patients by the end of this year”. About the profile of who can benefit from this new system, “the patients chosen are always the most serious and who have had the most recent hospitalisation due to heart failure decompensation. Stable patients are those who will, theoretically, not benefit so much from telemonitoring”. A team that uses telemonitoring has no holidays and is on call 24/7. When you’re in, you’re always all in. And if we think like this, we know that 10 people is a small number and that it is only possible thanks to the organisation between all. “We are fully committed to a programme that is only four and a half months old. It should be noted, however, that a lot of planning work preceded this achievement. It took us about a year to prepare it”. She tells me that “we have already seen positive results in the monitoring program, namely in terms of avoiding hospitalisations. The patient’s quality of life is considered an important aspect more and more each day. However, there are situations of heart failure that, due to their severity, will always generate need for hospitalisation and sometimes even have a fatal outcome. And it is due to this inevitable outcome that she also tells me “we are not Gods”. When I heard this last sentence, it occurred to me to ask that, even though she is not God, could a doctor be one of God’s great allies. “I think that God helps us a lot, because if we consider that God is believing in something stronger than our will, something greater than ourselves, we will always do our best”. The best is what Dulce Brito and her team do every day. If they continue to follow the warning signs, they will make more and more effective interventions, which will make prevention even more effective. Personalised follow-up will allow her to continue to follow the patient so closely that, sometimes, it is enough to “talk to them immediately and intensify their treatment” to avoid aggravation and consequent hospitalisation. Our time is up, the family of a patient was already waiting for Cardiologist Dulce Brito, who had a new clinical picture to draw. In the two hours we spoke, her lunchtime came and went, but she did not eat; she hurried into the rest of her day, like always does every day. The Physician and Teacher I saw entering the room was not the same person I saw leaving, but these were small privileges of those who get to know her a little bit for a couple of hours. And those fragments I keep for myself.